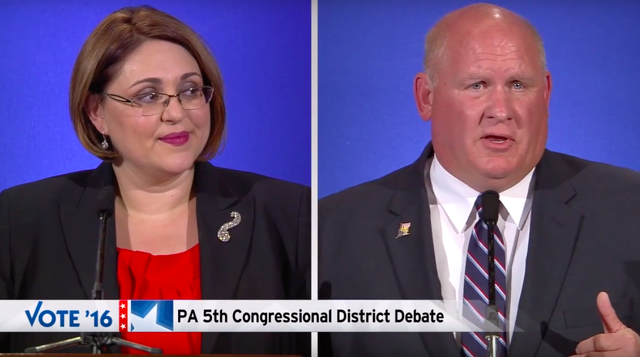 The candidates for Pennsylvania's 5th Congressional District met Saturday night at the WPSU studios in Innovation Park in a "Race for the 5th" debate. Republican incumbent Rep. Glenn Thompson of Howard, who is seeking a fifth term in the U.S. House of Representatives, and Democratic challenger Kerith Strano Taylor, a Jefferson County attorney making her second bid for the seat, took part in the hourlong debate. Both candidates affirmed their support for their respective parties' presidential nominees, Thompson for Donald Trump and Strano Taylor for Hillary Clinton. Thompson said that he found lewd comments about women made by Trump in a recently released 2005 video to be "rude and unacceptable," but that he believes Trump is the only choice for national security. He said his wife, a Sunday school teacher, also supports Trump. "Her explanation to me was that God takes the imperfect and makes perfect for his purpose," Thompson said. "When we look at this race I want a Commander-in-Chief that when our son who is still active-duty, if he in the future is deployed and his unit is under fire and they need reinforcements, they need someone to come in and save them, I want to have confidence in that person. "I want a Commander-in-Chief that's going to protect our national secrets and not do reckless and careless things whether its email or any other types of information. For me, the only candidate for that is Mr. Trump." Strano Taylor supported Bernie Sanders in the primary and was a delegate for the Vermont senator at the Democratic National Convention. But, she said, Clinton has earned her vote. "She had to sell me. I needed to hear that there was something I could stand behind in her candidacy," Strano Taylor said. "She has a history of collaborating with people and getting things done. And that's what it takes to get things done in Washington. "But most notably is her ability to deal with the vitriol and denigrating language coming at her with grace... We should be able to disagree without being disagreeable. It's something I admire most about Congressman Thompson. We've always been able to disagree without being disagreeable. I'm proud to cast my vote for Hillary Clinton but even more so I'm proud to cast my vote against Donald Trump. If my son repeated the things he said, I'd have to wash his mouth out with soap." Among the other issues addressed included what growing the economy and creating jobs, the Trans-Pacific Partnership, raising the minimum wage, campaign finance reform, the Affordable Care Act, climate change, fracking oversight, student loans and ending partisan gridlock. 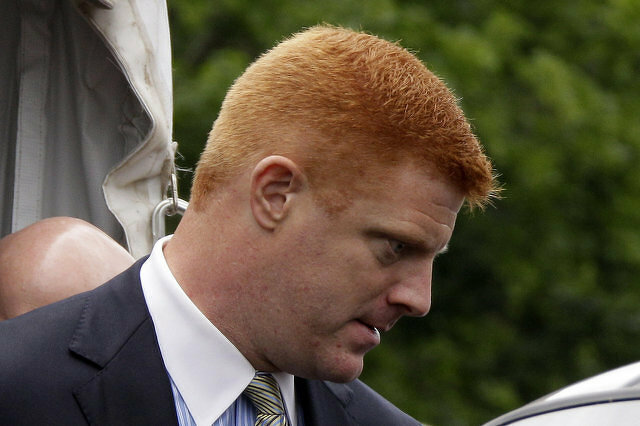 Barring a last-minute settlement deal, Mike McQueary's lawsuit against Penn State is set to begin Monday morning in Centre County Court.